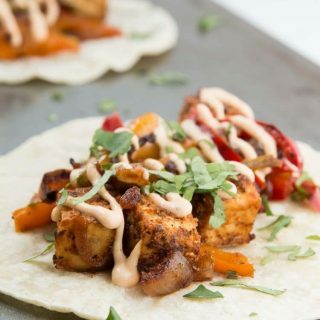 This gluten-free, easy, vegan tikka masala taco recipe is packed with delicious Indian flavors with a little street-style taco flair! Cut the block of tofu into 1/2-3/4" cubes. Toss the tofu cubes with 1 tbsp Spicemode Tikka Seasoning. Next toss the seasoned tofu cubes with 1 tbsp corn starch (this step works best if you use your hands). Arrange the seasoned tofu cubes in a single layer on the lined baking sheet. Bake for 20-25 minutes until crispy. Continue onto prepping the rest of the recipe while tofu bakes to save time. Place all the ingredients listed above for 'Chilifire Crema' in a high power blender (such as a vitamix) If you're using a non-high power blender, it'll still work well but just be sure that the cashews have been soaking for 3-4 hours to ensure a creamy sauce. Blend until completely smooth. Adjust the amount of salt, lemon juice, or Spicemode Chilifire Seasoning if needed. Place in the fridge to cool completely until you're ready to serve the tacos. Heat 2 teasp cooking oil in large non-stick pan on medium-high heat. Add the sliced red onions and bell peppers and saute on medium-high heat, mixing frequently, until cooked and slightly charred. At this point, the tofu should be done (if not, turn heat off the pan and wait). Once the tofu is baked and crispy, remove from the oven and add it to the sauteed onion and pepper mixture. Combine and saute together on medium heat for 1-2 minutes. Adjust the amount of salt if needed. Grill corn tortilla on both sides. Add a generous layer of the tofu-onion-pepper mixture in the center, followed by the cooled creamy Chilifire Crema. Garnish with some freshly chopped cilantro and serve! Prep-Ahead Tip - make the tofu-onion-pepper mixture and chilifire crema and store in the fridge. Once you're ready to serve, simply heat up the filling, grill some corn tortilla, and assemble. To make this dish in 30 minutes, you'll need to multi-task as indicated above. While the tofu is baking, prepare the chilifire crema and filling mixture. For another side-dish option, the baked crispy tofu tastes great dipped in the chilifire crema!